The holidays can be a trying time of the year for introverts. Whether you’re a quiet teen on winter break or an adult winging in from abroad, a family holiday means you’ll be in close contact with people you see rarely or only in measured, predictable doses. Some of those wonderful folks you call kin may be so excited to see you that they nearly smother you with attention. No matter how much you love Mom or Uncle Ted or your sister Trudy, though, your introverted personality can’t (and shouldn’t) be put on hold for the duration of your visit. It’s bad for you, it may well backfire on them, and it could spell disaster for your familial get-together. Planning ahead (and making those plans known) is the least hurtful and most effective way to create space for yourself during the holidays. Is a childhood friend also in town for a festive weekend? Make plans to meet them for coffee. Your extroverted cousin Nancy can’t object if you appear to be being social. If your childhood friend is a fellow introvert, you both benefit—and you may just get a bit of intimate, energizing conversation in as well. The arts may offer another escape. Search out a nearby museum with a temporary exhibit, then go to it. You can reasonably claim that it’s a rare opportunity, thus sparing feelings, and you’ll buy yourself a couple of hours of solitude—three if you let yourself savor an overpriced museum cafe coffee. Should you feel like you have to include others in your cultural outings, suggest that everyone attend a holiday concert or other similar event. You’ll still have to talk to your relations during intermission, but at least you’ll be able to drift away mentally while the music is playing. It’s Thanksgiving, and all nine of the other adults that your parents have somehow managed to cram into their three-bedroom house are excited for Black Friday. You remember the last time you attended a Black Friday event–in fact, you still have nightmares about it. But there’s a surefire way out of doing another tour of duty in the enemy-choked aisles of Walmart. That way is martyrdom via childcare. If someone tells you they don’t mind hauling their small children to Black Friday, they are lying. You can relieve them of that lie and earn yourself some alone time by volunteering to stay home and babysit. The wee ones’ parents may try to brush off your offer, but stay strong. Remind them that the holidays are about the children, who will enjoy them so much more if they aren’t crammed into a car seat or a shopping cart at 4 a.m. Then wave merrily out the window as they back down the night-black driveway and leave you finally, blessedly alone. Oh, holy night. To be fair, you still have to babysit. But the odds are good that the kids will sleep through the latest/earliest sales that your family (how are you related to them, again?) is so eager to attend. With any luck they’ll wake up just as their parents walk blearily through the front door, laden with bags. Those bags play straight into your hand for dirty deed number two. Every family has a member who despises gift wrapping, and usually a few who are ambivalent about it, too. Be a helpful elf and donate your time to the cause. Little Susie won’t recognize your handwriting on the gift tags, Dad and the boys can watch the Big Game, and Aunt Sarah won’t ruin her manicure. In exchange for your generosity, you get to sit alone in a locked room with your choice of music or TV and a hot cup of tea or cocoa for company. Even if you’re the anti-wrapper in the family, the trade-off may be worth it. This one goes along with planning ahead to an extent, but it comes in handy for those bound-to-happen last minute holiday events, too. Designate yourself the family schedule-keeper. Buy or make a planner, and write down everything you’ve been invited to on each given day. Then, set a limit. Christmas Eve always consists of a long family dinner, a trip to view the neighborhood lights, and a reading of “The Night Before Christmas”? That’s enough for any introvert to stomach in one day. Book yourself some alone time that morning to help you gear up for the evening’s festivities. Then when Grandma Joan asks you out of the blue to spend four hours rolling out pie dough while she reminisces about sugar rationing, you’ll be able to check your calendar and shake your head sadly. Sorry, Grandma, but you’re already booked. Some members of the family might really loathe that planner of yours. Fortunately you can turn this to your advantage. If you keep track of what everyone else is doing, you may well find yourself lauded as a timetable hero. Mom can’t find your brother Bobby for lunch? That’s because he and Julie took the kids to her parents’ for the afternoon. Cousin Sue was supposed to help with cookie decorating? Well, she said she was going to church this morning. Before long everyone might be so interested in knowing each others’ whereabouts that they won’t worry about yours. Protip: laminate the calendar, buy an erasable marker, and hang it in the dining room so you can get back to your book/show/sleep. Sometimes the above tips won’t be enough. Sometimes you’ll have a family member who can’t be distracted or shaken off or made complacent. Sometimes all your other tricks will work perfectly, but you’ll still find yourself grinding your teeth and seeking solitude. In emergencies such as these, you have a final option: fake it. A winter cold has your sinuses plugged up, but you’re sure a long, hot bath will fix it. Even if your sinuses are marvelously clear, you’ve just bought yourself an hour in the tub with a book, a bottle of wine, and Brahms. Try feeling “under the weather” if you’re craving some time alone in your childhood bedroom. It’s probably not that far from the truth—not enough alone time might cause you to suffer from an introvert hangover. This is a last-ditch measure, of course, and should be used only in the most dire of introvert crises. After all, this is still your family we’re talking about; hypothetically, you love them. But sometimes a little white lie is what’s needed to save the day. 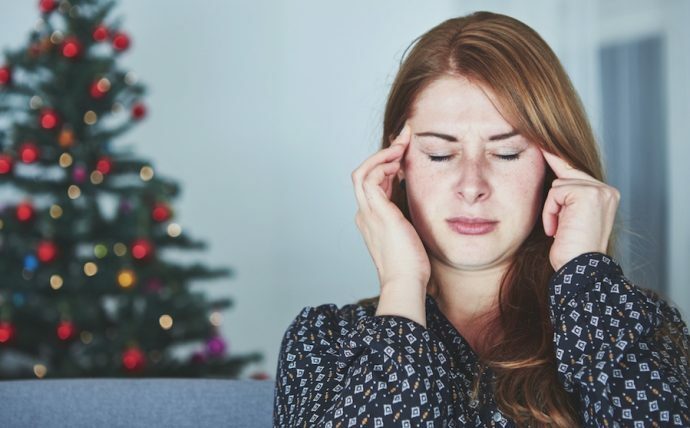 And even if you feel a twinge of guilt over using one or more of these methods this season, you can at least rest assured that self-neglect didn’t turn you into the Grinch who stole Christmas.